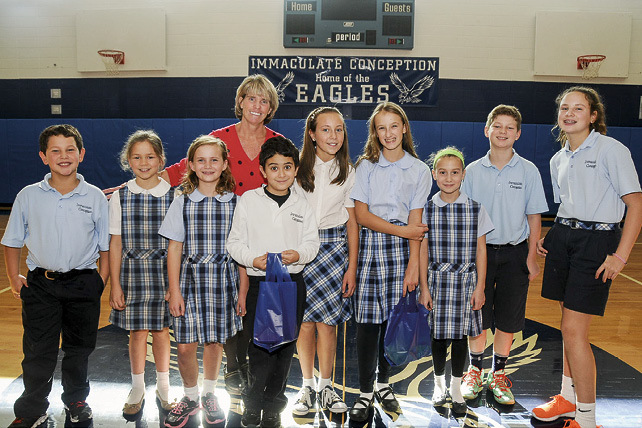 Immaculate Conception School, Fayetteville, celebrates the 10-year anniversary of its Mercedes Benz raffle this year. Part of the proceeds from this year’s raffle will go to a local group spearheaded by a former IC student, Dylan Letcher, who helped transform an acre and a half of his family’s land into a vegetable farm with produce donated to local food pantries, including those at Franciscan Church of the Assumption, St. Lucy’s and Holy Trinity parishes. In addition, this year, students in Grades 3 through 6 will assist Development Director Kim Sheridan with the ideas and logistics that make the raffle happen. A portion of the proceeds also goes to help support school programs.